This week in 1988, school holidays were coming to an end and it was back to school - I was going into Year 8. Bad, Kick and Faith had been the soundtrack of my summer (on my bright red Sony Walkman, no less) and had iTunes been in existence, "(I've Had) The Time Of My Life" would have topped my most played list. "(I've Had) The Time Of My Life" was still making its way up the ARIA chart at this point, and I quite liked being an early adopter in that instance. 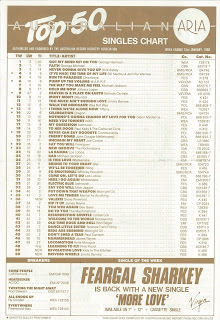 In fact, as 1988 went on, I began to pride myself on being ahead of the chart instead of looking to it for guidance. Especially when that guidance would have come in the form of a new Jimmy Barnes single. Jimmy gives us our first new entry of the week, while at the other end of the chart, George Harrison's "Got My Mind Set On You" finally got a week at number 1, dislodging "Faith" after just one week. This third and final single from the La Bamba soundtrack found the former chart-toppers at the other extreme of the top 100 with a song that'd reached number 4 in 1959 for Richie Valens. Taken from the acclaimed first solo album by the former member of The Band, this single features backing vocals from Sam Llanas from BoDeans. Before she was in The Clouds, singer Jodi Phillis was the frontwoman for this short-lived band from Sydney, who parted ways later in the year. "You Win Again" had been a welcome return to form and chart success for the brothers Gibb, but this follow-up and title track of their comeback album didn't follow suit. This was the lead single from former Intaferon member Simon Fellowes's second album, Never Never Land. On his first album, he'd covered Hoodoo Gurus' "I Want You Back". 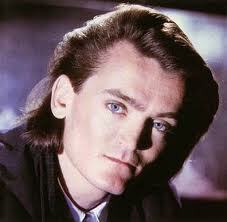 In 1985-86, Feargal had become the textbook example of a two-hit wonder. 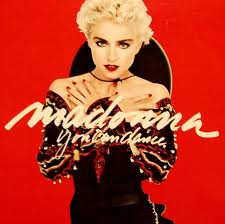 "A Good Heart" had been a number 1 here and in the UK, and its follow-up, "You Little Thief", also cracked the top 5 in both countries. 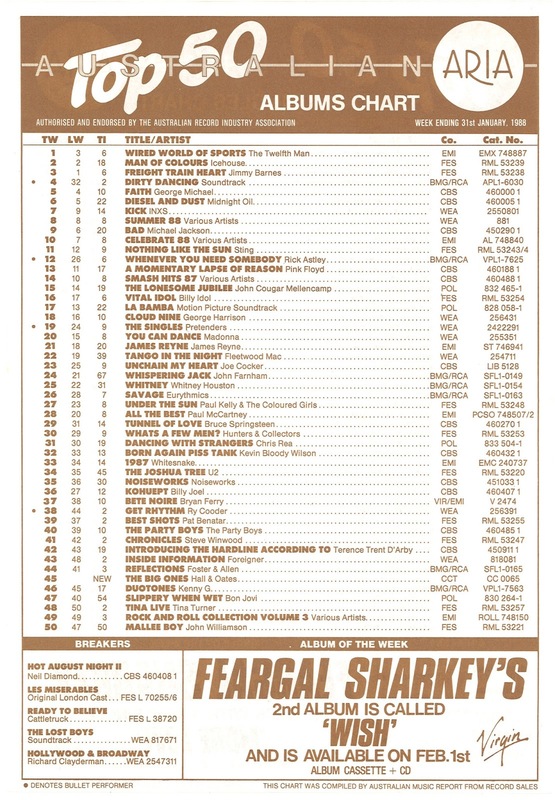 A few years later, Feargal's fans had deserted him, with this first single from second album Wish (which received the Album Of The Week treatment on the flipside of the chart) peaking outside the top 50. I must admit I could only vaguely remember this song from the time and it took a listen to the clip below to ring any bells. That listen also allowed me to conclude that "More Love" reached the chart position it probably deserved. Ry Cooder, Robert Cray, Joe Satriani, Gary Moore... Australia loved guitarists in the '80s. Me, not so much. This is the first time I've listened to this Elvis Presley cover from Ry's Get Rhythm album and it hasn't been that pleasant an experience. 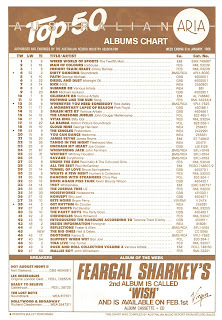 "All Shook Up" peaked at the same position as Feargal's single and, with that fact out of the way, does anyone mind if I move on? It just gets worse! I was never a fan of Jimmy's in the 1980s and this song about trucking was hardly going to be the one to convert me. Having said that, I did quite like "Chained To The Wheel" by The Black Sorrows the following year, but "Driving Wheels" was too... well, Barnes-ish for me. "Driving Wheels" would go on to be a decent hit, even if that was a bit of a dip from chart-topper "Too Much Ain't Enough Love". But, since parent album Freight Train Heart had also reached the top by this stage, the normal law of dimishing returns applied, something that was borne out by Jimmy's two subsequent singles, which reached the top 30 and top 40 respectively. 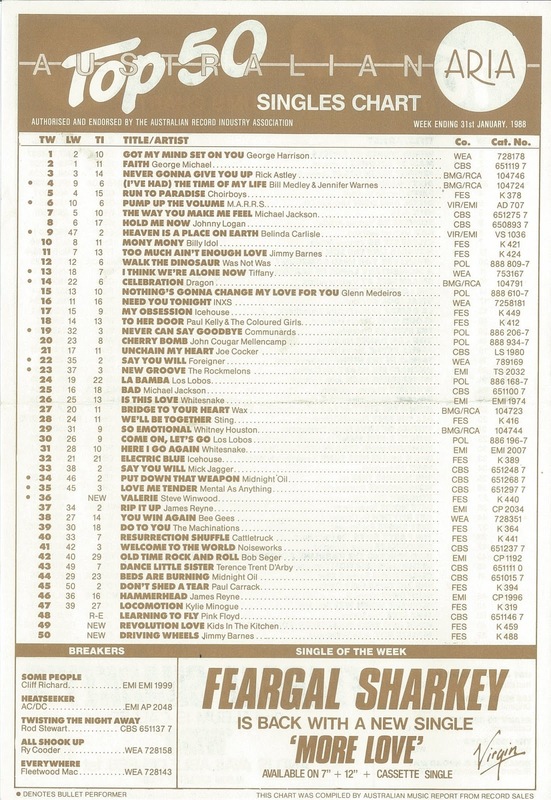 Here's a song I talked about in my personal 1987 countdown, and given it took until the end of January 1988 to crack the top 50, it should come as no surprise that it only managed to climb five more places. "Revolution Love" would end up as KITK's final single, with the band breaking up within the year. Scott Carne would try his hand at a couple of musical directions after the split, forming the short-lived rockabilly group Priscilla's Nightmare and releasing a couple of ill-fated solo singles like "All I Want To Do" in 1990, neither of which were anywhere near as good as KITK. These days, he performs regularly on the retro circuit, often in league with Brian Mannix. Years before it was sampled by Eric Prydz (or, more accurately, the vocal was re-recorded by Steve) for "Call On Me", "Valerie" was released to promote Chronicles, a greatest hits album by the former Traffic and Spencer Davis Group member. 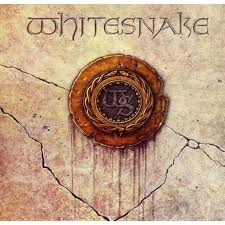 Even more years before this 1987 remix of "Valerie" came out, the song had been a single in 1982 from Steve's third solo album, Talking Back To The Night. The original version of "Valerie" had bombed, but this updated version rectified that, peaking at number 19 in both Australia and the UK, and 10 places higher in the US. The turnaround in chart fortunes was likely down to Steve's previous studio album, Back In The High Life, which had contained a number of hits, although only one, "Higher Love", made it onto Chronicles. With only a few singles to talk about this week (and even less that I actually care for), it's the perfect time to turn the chart over and ask: what albums were Australians buying 25 years ago? Only four of the top 50 albums were by solo female singers - Whitney Houston, Pat Benatar (a best of), Madonna (a remix album) and Tina Turner (a live album), with Whitney the only original studio album. Three other entries were by groups with female singers - Fleetwood Mac, The Pretenders and Eurythmics, meaning women were sorely under-represented musically in January 1988. Summer 88 and Celebrate 88 appear higher on the chart, but the compilation everyone who was around at the time remembers is Smash Hits 87, which featured a denim jacket on the cover - a denim jacket worn by none other than Kylie Minogue. Meanwhile, Dirty Dancing made the week's biggest jump within the top 50, on its way to dominating the chart for the rest of the year (and winding up as the year's second highest-selling album). The highest-selling album of the week was the first LP-length offering from Billy Birmingham (aka The Twelfth Man). 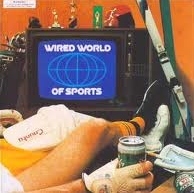 Wired World Of Sports spent three weeks on top, a position every single album by the comedian has reached - and there have been seven of them! That's a lot of jokes about Indian surnames. Further down the chart, Kevin "Bloody" Wilson made an appearance with the third of his five top 50 albums. From Barnesy to Farnsy, Whitesnake to Pink Floyd, Billy Joel to Billy Idol, the ARIA top 50 was packed with just about every style of rock music imaginable, with at least 30 albums being categorisable as rock or pop/rock. And no, I'm not including Kenny G or Foster & Allen in that tally! Next week: four new entries - three I quite liked and one I really hated. See you then! I wasn't expecting to know 'E.S.P.' but the "higher and higher" bit leading into the chorus sounds familiar. I had noticed the lack of female artists on the singles chart around late '87/early '88 before, and only one of the 10 singles discussed this week contains a female vocalist.